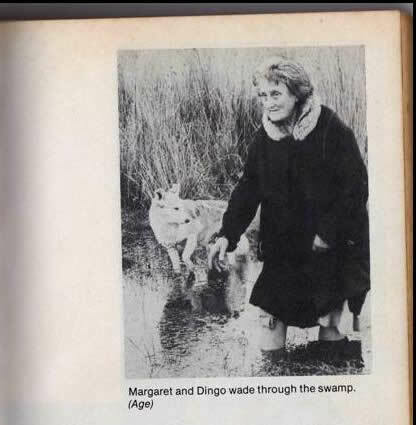 Waaaaay back in May 2012, after listening to a fascinating and creepy story from a friend with a house at Venus Bay, I wrote a post called Gippsland Gothic, about two eccentric women who lived Misses-Havisham style in a crumbling homestead in marshland. One died, the other disappeared, and the mystery continues. I’m not really fussed about blog stats – this isn’t a commercial blog after all – but I noticed something interesting after that: Not a day has gone by without someone hitting that post or using search strings on Tullaree, Margaret Clement and other keywords relating to the story. There really is a lot of interest out there about that story. 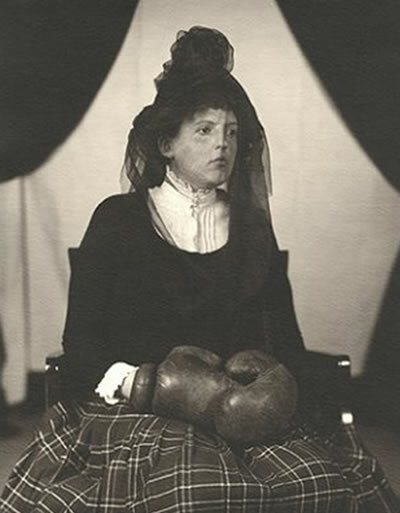 Commenter Jane-Louise Hobson has written a play called Tale of Tullaree about Margaret Clement. There’s a reading on at the Wonthaggi Theatre Group next weekend, with matinees both days and one evening show. Details are here. I’m going with the friend who first told me the story, and we’ll stay the night down at Venus Bay, where Margaret’s bones were found. Or the bones, that is, which might have been hers, and which have also disappeared. Le Chien qui Fume: Help Fine make a movie! Le Chien qui Fume – A Smokey Life. from Liz Burke on Vimeo. If you were a reader or writer at Larvatus Prodeo you’ll remember Fine – with the adorable whippet avatar. Blow me down but Fine isn’t a whippet at all but a filmmaker. 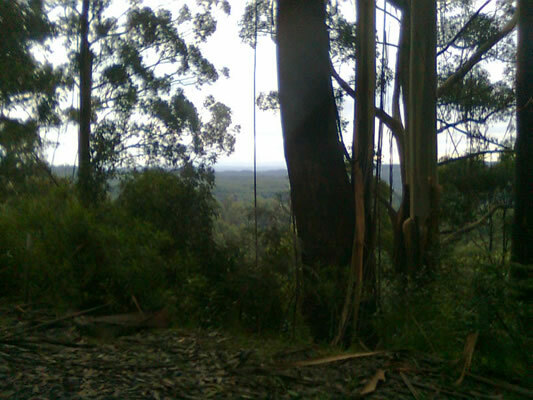 This Pozible page is raising funds to make a feature film, Le Chien Qui Fume (The Smoking Dog). We’re raising finance to produce a preview/trailer for this feature film. We’ll then use that preview/trailer to showcase all the elements of the film and approach financiers, to raise the money for the feature. We know we need to produce a high standard trailer to convince potential funding partners that our concept will work. The money raised will go into minimal cast and crew costs, location and catering fees, art department and post-production. We can make a great preview/trailer for this money. So, please come along for the ride. Follow the link above for more info on Fin… er Liz Burke, Donna Rae and Michael Vale. Here’s the Facebook page. And please, kick a few dollars in for the Smoking Dog. And, blow me down again (and I’d only just got up again and dusted myself off) when I watched the little promo vid, who should pop up but that ubiquitous and brilliant pair Dave Graney and Clare Moore, who I’d just been to see play at the Newport Substation, where they blew us all away. They’re doing the music for the movie. Quelle Coincidence! No, he hasn’t died. I just point that out because you’re increasingly accustomed to seeing the older music idols trending in twitter or appearing in the news as they drop off, so seeing that post title may have given you a nasty moment. 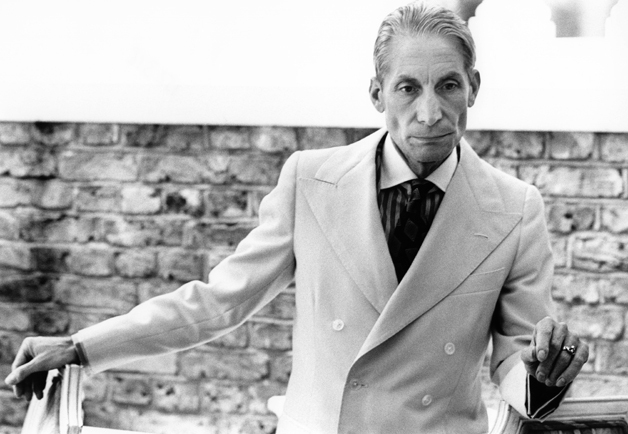 No, as a friend of mine used to say, he looks like he just stepped out of the pages of Gentleman’s Quarterly. As indeed he has. My brother and his lovely companion are travelling up North using a combination of hire cars and the Ghan, using this site to blog about their trip. Stuck at home on the Queen’s Birthday, when it was quite sunny and the current floods/earthquakes/hail/plagues of frogs hadn’t yet started, I was siezed by Trip Envy. If I couldn’t take the Ghan up to Alice, by golly, I could take the bike along the Federation Trail! My aim was to start in Yarraville and ride halfway to Werribee. Yes, I know, ambitious. I started off at Williamstown Road where a new section of the trail is meant to link Yarraville to Altona. Thanks to the Baillieu Government’s abrupt discontinuation of bicycle infrastructure funds, this discontinued abruptly. 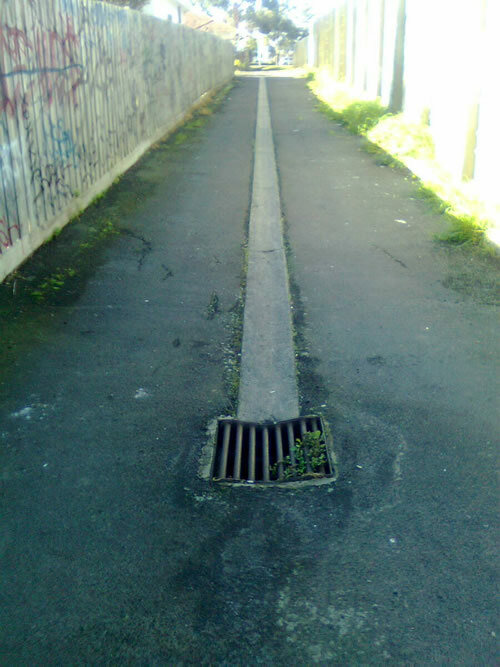 They didn’t even have the money to fix this front-wheel-devouring drain in the first section. Buzzfeed.com has a page called 50 Unexplainable Black and white Photos. It’s a tour de force of WTF, but it lacks one thing: captions! Here are some of mine. Laetitia's parlour seemed to be safe enough, but Hermione was taking no chances. She’s back! Tess McKenna and the magnificent Shapiros return for an afternoon of stellar electric folk/rock & blues with pitch-perfect harmonies. 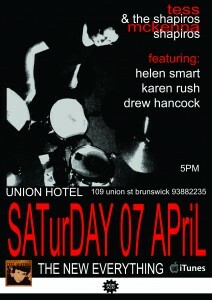 If you’re in town over Easter, come along! The Tunnel: Location, Location, Location! I hired a DVD a couple of days ago, The Tunnel. It’s a new Australian horror movie in the style popularised by Blair Witch and Paranormal Activity, although better, we thought, than either; a faux-doco complete with jumpy camera and white-on-black text. It’s interesting in several ways. Visually, it manages the jumpy-grainy-camera style much more gracefully by the simple and inspired move of making the characters a professional TV news team. It’s also interesting in the way the film is made and funded, through the new concept 135K project. But what really grabbed and held me about this film was the location – a network of subterranean tunnels underneath Sydney, which are real, and of which I was completely ignorant. Journalist Steve Dow has visited the tunnels and other secret places in Sydney. In the inky darkness, we sweep torch lights side to side and slosh through sludgy earth in Sydney’s great unfinished eastern suburbs subway – which would never actually see a train, but instead become an air raid shelter. …(A)fter planners and politicians disagreed on the route, work on the eastern suburbs tunnels was abruptly halted close to the ANZAC Memorial. During World War II, the tunnels were converted into a public air raid shelter, which Sydneysiders thankfully never had to press into service. Brick dividing walls were added to create smaller bomb shelter chambers. Australian Imperial Forces officers stationed down here scrawled their messages that can still be seen, including their regiment number and the date, many in 1942. We step into a rectangular chamber flooded in ankle-deep water, in which stands a rustic steel bell with a pointy top almost as tall as a person. One of our group whacks the bell with a plank of wood: the gong sound is deafening. Sydney sound-sculpture artist Nigel Helyer created and installed the work, known as An UnRequited Space, as part of ArtSpace Sydney’s Working in Public project in 1992, employing a wooden mallet “to sound out the midnight chime on ABC National for 21 consecutive days”, Helyer says. Memo to the ABC: your microphone cable missing for 16 years is still connected between the bell and wall down here. The bell features in the movie and you can see it in the trailer. I had wondered if it was real. The room it’s in is dry in the film, probably because of the extended drought. As we trek north, the air becomes more humid. We climb up a rickety metal ladder through a hole only half excavated and slip down a muddy embankment, meeting the edge of “Lake St James”: the drainage system of the city outer tunnel next door, the water stretches left and out of sight for a kilometre, 10 metres wide and about five metres deep. The NSW Government says it aims to collect rainwater in tanks from the roofs of Parliament House, the State Library and Sydney Hospital, store the water in Lake St James, and recycle it back through the non-drinking system. Well, you certainly wouldn’t ingest this stuff, its fine film of brake dust floating on top. The abandonment of the NSW government plan to use Lake St James as a water storage reservoir for Sydney is the real-life event on which The Tunnel hinges. In the film we see some of the old wartime air raid shelter rooms and hear the story of General Macarthur possibly having an emergency bunker down there. Unfortunately, my googling failed to find any regular organised tours of the tunnels. This film is a must-see for anyone who likes to think of the strange, secret and eerie places which exist under our feet. 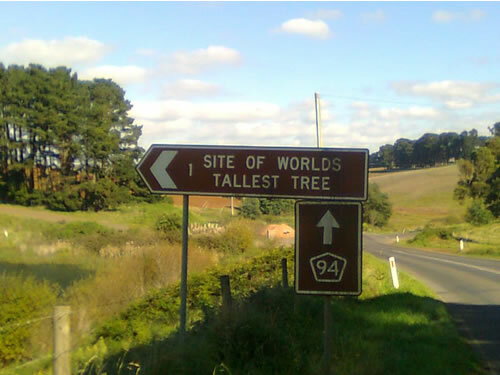 Road sign - "Site of World's Tallest Tree"
The O’Reallys are the typical so-called “well-off” family who are now staring down the barrel of the Gillard government’s crushing “middle-class welfare” reform. Our intrepid editor sent this reporter out to one of the up and coming suburbs to get the real lowdown on how hard hit these families are by this merciless class warfare. One of the countless Aspirational Families in these tree-lined streets™, Tom and Sue O’Really work as a teacher and a construction estimator. They have two children, Lily and Bradley. Lily, 6, has started primary school and attends after-school care. Bradley, 3, is in daycare. Sue’s income is just over $150,000, making them rich in the eyes of Labor and Leftist types who choose to ignore the stark, brutal reality of their suburban struggle. Newsfax Ltd: Now that the rate at which the family tax benefit cuts out has been frozen at $150,000, will this spell the end of your middle class lifestyle? Sue O’Really: Well, of course, a lump sum in your tax return is always nice. But really, isn’t government income distribution meant to be targeted at, you know, really struggling families, on $40,000 and less? I mean, of course your wants always expand when you get more money. (Laughs) but shouldn’t we be directing Family Tax Benefit to families who can’t afford to send their kids to the dentist? Or use the money to put dentistry on Medicare? Newsfax Ltd: But food, clothing, gas electricity — it all adds up. Not to mention childcare and your private medical insurance, for which you now get only 20% rebate instead of 30%. With the cost of living increasing, shouldn’t eligibility for family benefits should have been lifted? Sue O’Really: Look, of course the cost of living goes up. I’m not arguing with that, I just wonder whether “adrift in ocean of debt and despair” isn’t over-egging it a bit. Half of all workers earn less than $44,146 per year. Shouldn’t you be interviewing one of them? I mean, they’re taking money away from Leonie three doors down, for god’s sake, she’s on the single mother’s benefit and they’re going to put her on Newstart when her daughter turns 12! And… wasn’t it your paper and others like you who used to be against “middle-class welfare”, anyway? Newsfax Ltd: Well, Wayne Swan said himself you weren’t that well-off!